Oooh fantastic, love them patinas on the sticky foil tape. Stunning! I'm in love! The colors, the embossing folders, and your most used stamps. Love I'm telling you! Ha. Thanks so much for the inspiration. Beautiful!! I love everything about it. Oh my gosh! If that isn't just the neatest box!?!?!??!?!!!! SO cool, Linda! Love the look of the metal foil. Very inspiring project!! Fabulous. So I'm pinning it to remember! What a fabulous, cool piece! Stunning colour combo and all the additional elements really enhance the finished project! Lucky recipient, I am sure they are going the love it!! This is so awesome. love it. 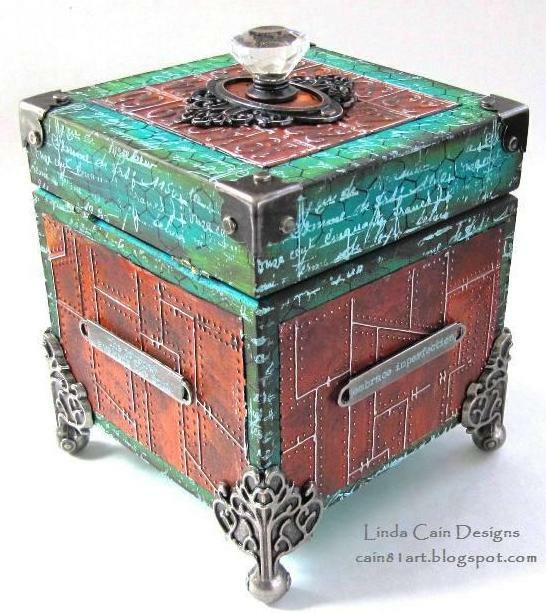 What a stunning piece of art and how happy that recipient will be when they get it! Gorgeous! By the way, if you dream up the lottery numbers, let me know LOL! Still love this, even more after seeing all of the closeups. :) Amazing!!! Amazing! The colors, the embossing, every detail! Awesome. Thanks for the great tutorial. It is those late nights that all our great crafting ideas emerge. I love what you did here, so beautiful too. I really love the metal sentiments you have on it. Great Epiphany. I love everything about this box! Great job. Fantastic!! !do you sell the things you do like this box?? Amazing! The whole thing is gorgeous with all the texture. My favorite is the rusty metal effect that you created. I am sure your friend LOVES it!! Wow, this is so AWESOME!!! 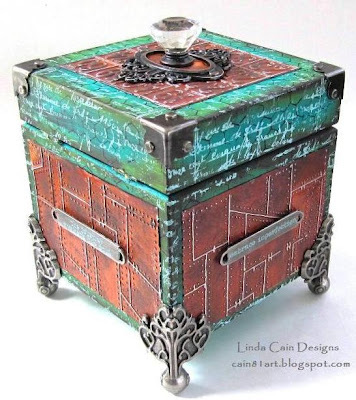 Love the rusted look with the turquoise, very appealing! Simply gorgeous! You are uber talented! What a gorgeous box. The effect of the embossing and Vintaj patinas is incredible. Love how the Fresco paint ages it further and highlights the details. Fabulous stamping on the turquoise. Gorgeous colours and texture. Thanks for the inspiration and how-tos. Hey Linda, I get my best ideas at night too. lol. So know the feeling of needing to jump out of bed and at least jot the thought down. This is an awesome project! Just love that riveted metal texture. This came out so so cool. I really wish I would have some of these types of Epiphany. Wonderful!!!!!!!!!! I must try this!!! LOVE LOVE LOVE this box. Lucky reciepient!! !